2muchachos stuff: good news - spring is coming! Could this be one of the most beautiful things i have ever heard in my life? I think so! "Dreaming Girl" -(Acoustic version)is so minimal and stunningly beautiful at the same time. I open myself up completely to its beauty soaking in the bliss that ends up melting my heart with the love i feel from it. 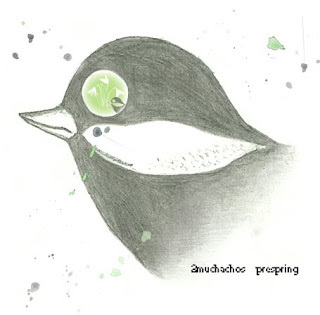 "Snowdrops" is very much like 2muchachos unknowingly attempting a Cocteau Twins/Ulrich Schnauss style sort of track and is heavenly sounding and i would imagine shoegazers would also love this track! "Warmtime" has become abit of a 2muchachos classic! Again so much beauty and warmth, reminds me of Ulrich Schnauss and Sleepy Town Manufacture. I can hear background noise which gives a natural atmospheric sound that adds to the flow of the music. There are also some icelandic styles like "Mum". You have guessed our secret!